Inder Loves Folk Art: Not sewing. Apparently, the mere idea of sewing all of those Christmas presents was enough to completely chill my sewing mojo. I haven't so much as touched my sewing machine since announcing my intentions to make a guzillion presents for folks. There's nothing like a long to-do list and a hard deadline to drain all of the fun out of a hobby, right? Let this be a lesson. Since sewing sounds about as appealing as getting a root canal right now, I've had to turn to other obsessions. So I've become fixated on learning to play banjo, and spent the past few days combing Craigslist for used banjos. Watch out - this may morph into a banjo blog, right before your eyes! (If this sudden talk of banjos seems a bit random to you, just keep in mind that I gave my child the middle name Roscoe after the great Roscoe Holcomb. My close friends and family have seen this coming for a while.) Just what I need, right? Another hobby! In other news. Last night, we had dinner with our friends and their little boys. Getting ready to go, Joe was so excited to see his friends that he took off running towards the front door, and tripped and fell, hitting his face on a little metal space heater on the way down (thankfully, it was turned off). Ouch! He was pretty bummed for a minute or two, but characteristically got over it almost right away. I think I've mentioned that Joe has a freakishly high tolerance for pain, right? So we forgot all about it. It doesn't seem to be bothering him one bit now, but it looks pretty awful! My poor little bruiser. December sewing tantrum! Totally!!! Love it! Oh, poor little guy! Good thing he's as tough as nails! And good luck finding a banjo...I can't wait to see where this goes! I got my mandolin used at a local type music store near my university. Worth a look at your local music stores too in your banjo hunt. Ooh banjo! I'm excited! Charlie has been learning the guitar and I practically cried with pride to see him miming the chords to Eye of the Tiger, deadpan, on a cardboard guitar at his school singing night last night. I think playing a strummable instrument is a very worthy hobby. Sewing should not be a chore. Sending good bargain-banjo-finding vibes your way. 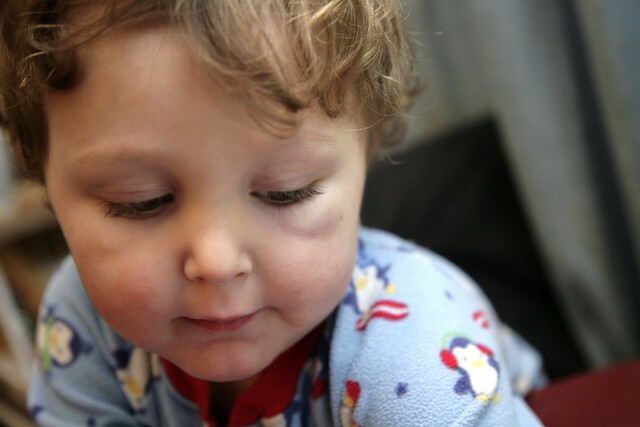 Joe is ridiculously cute even with a shiner! It would be so nice if the cute-no-matter-what magic didn't wear off as we age! I so want to play the banjo as well! But a blogger buddy suggested I try to dobo. Now, I dunno. Oy. Hope little Joe heals soon. Ouch! Poor guy. I got a loaner banjo from a friend!!! Squeeee! More about that on the blog soon! Having given up my plan of actually sewing up all this stuff before Christmas, maybe I can just enjoy working on a couple projects again. For me, it can be a struggle to keep my job my job and my hobbies my hobbies!